Significant increase of the level of details: If there is a built-in map, then the map of Brazil will overlay the built-in map. Outside Brazil, the built-in map is still available. Most GPS devices support enabling and disabling maps, so you can easily switch between different maps. If your GPS device supports profiles, then you can bind different maps to different profiles. Autorouting on a PC: Computes routes on a computer. These routes can be transferred to a GPS device. Map areas: The map is divided into a number of areas. Depending on the amount of memory available in the GPS device, one or more areas can be transferred to any GARMIN GPS device that supports maps. Packaging: One CDrom including customer code to receive free unlock code. Does not include a cable for data exchange, if you need such a connection cable, see our selection of options. 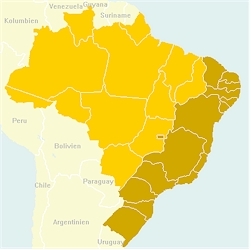 The images below show areas of the map of Brazil.